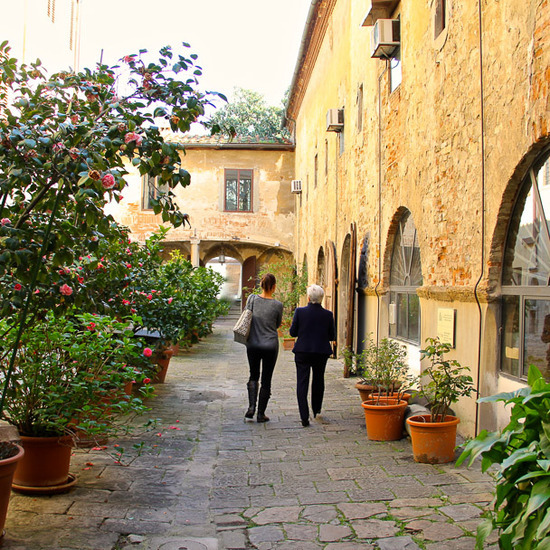 The area of Santa Croce is historically renowned for its leather making. Ancient tanneries used to line the streets on Via dei Conciatori (Tanners’ Street) and Corso dei Tintori (Dyers’ Street). 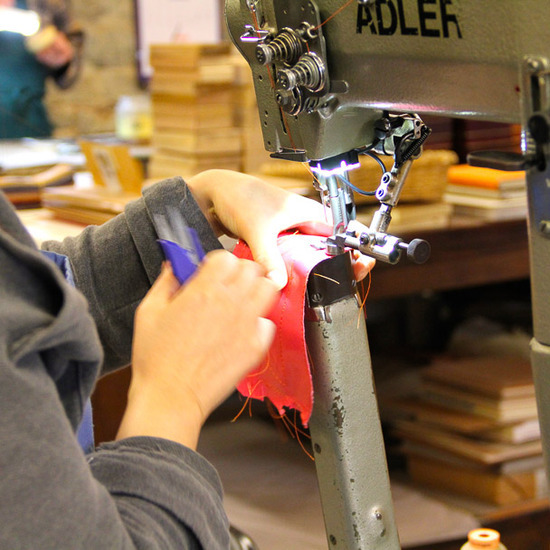 Florence prides itself on tradition and for those wishing to learn about leather making, or if just after a quality handbag, Scuola Del Cuoio is the ideal place to visit. I first heard about Scuola Del Cuoio by word of mouth. 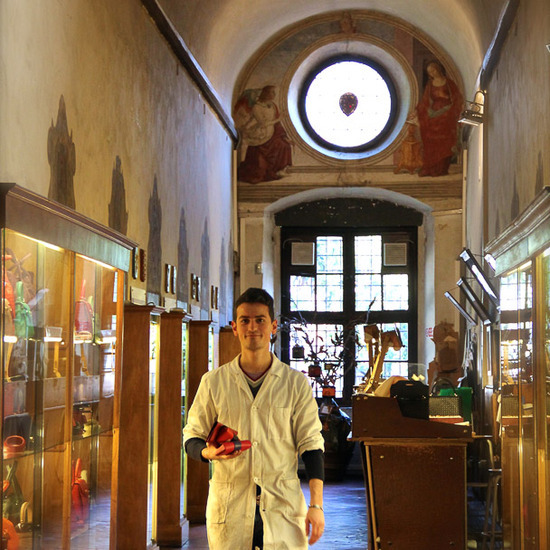 Had I been to the leather school within the church grounds of Santa Croce? From the first time I entered, taking the discreet archway to the left of the church façade, I was mesmerised. Following small signs around the church Apse I came to a quiet courtyard where artisans worked under exposed brick arches, carefully cutting coloured leather. Moving inside the main building, I was drawn into this magical world with an extraordinary history. 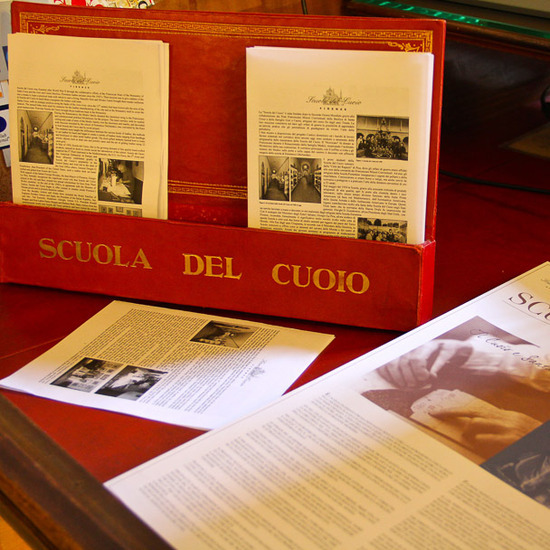 Created 64 years ago by Marcello Gori, Scuola Del Cuoio is still a family affair. Sisters Laura, Francesca and Barbara Gori all play a vital part in continuing the ethos of the school developed by their father. 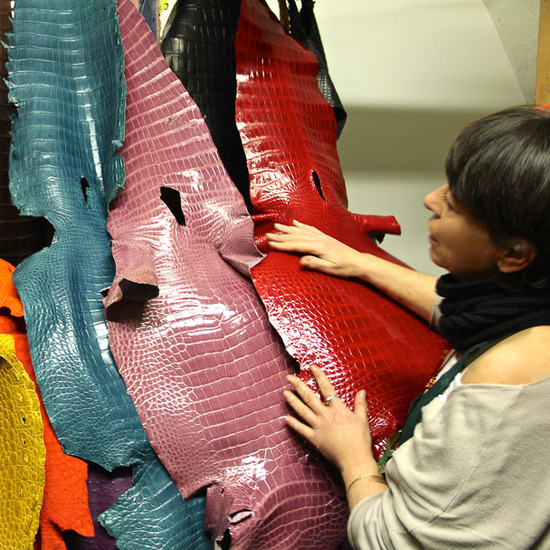 The Gori family have been Florentine leather makers for almost 100 years beginning with a store on via del Corso in 1932. In 1950, Mr Gori with his cousin Silvano Casini were invited by the Franciscan Friars of the Monastery of Santa Croce to teach a practical skill to orphans affected by World War II. 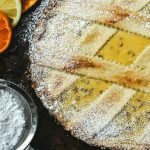 Housed in what was once the home of trainee monks, the current workshop and showroom stand under wonderful 15th century arched ceilings complete with Renaissance frescos and the Medici coat of arms. 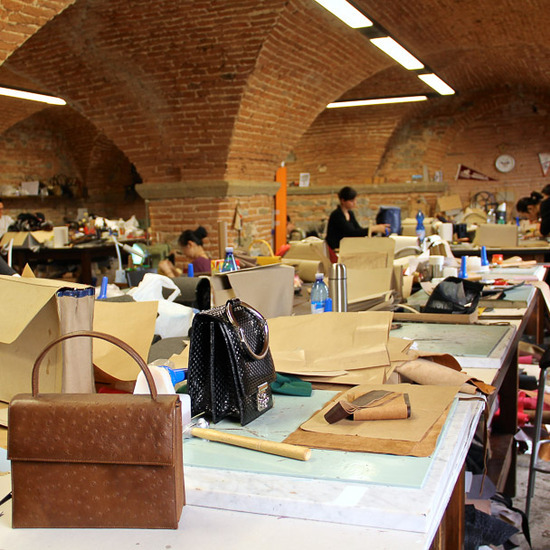 Today the school is still full of students, most travelling from all over the world to train under the Gori family’s guidance learning classic Florentine leather making skills. 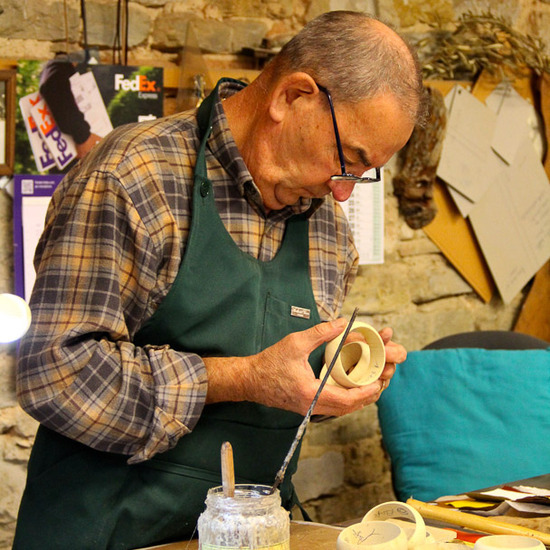 Everything you see is made by hand using traditional methods and original designs. Handbags are central to the collection. Laura designs the classic style while Francesca makes one-of a-kind hand stitched bejewel bags. 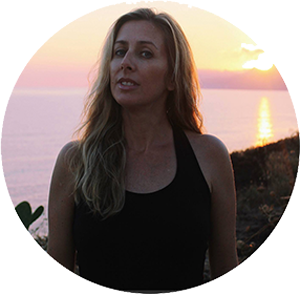 You can also create your own bespoke bag by working with Francesca on your creative idea. 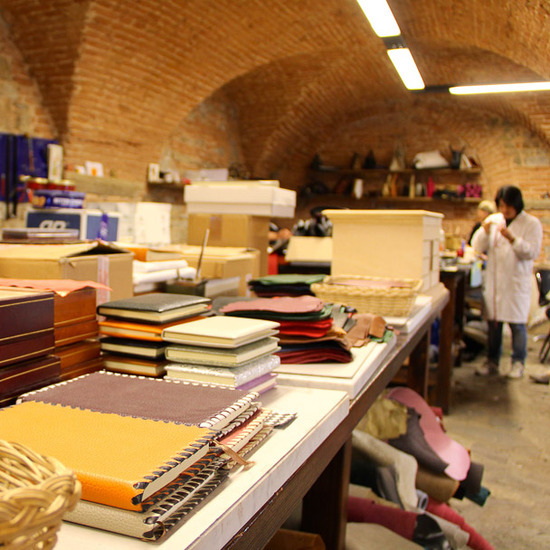 The store also sells tailored jackets, leather-bound notebooks and purses. 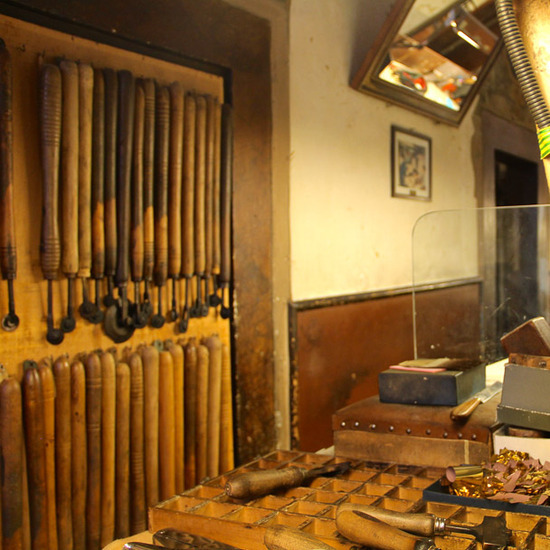 Free weekday tours of the school include a leather making demonstration, and longer technical visits (€14 hour) are also available. The school offers short half-day workshops as well as longer six-month courses for those wishing to embrace the techniques on offer. For more information or to reserve a tour, email here.